MANAGE AND MONITOR POWER, COOLING AND SPACE. I n the traditional sense, RAMP DCIM manages and monitors the facilities side of the data center: power, cooling and space. A data center’s space and environment metrics are tracked and managed, and any alarms or alerts are quickly communicated to many of the management software that RAMP DCIM integrates with. As RAMP DCIM is vendor agnostic, it can communicate with almost any data center technology vendor device, and already has a deep understanding of over 10,000 devices in its database. 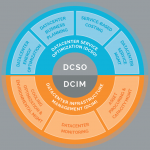 Conversely, RAMP DCIM connects the business side of operating a data center to the facilities side. A data center manager can for example, quickly get a report on which of the older servers are consuming most power and seek to replace them with more energy efficient ones. RAMP DCIM’s “Custom Properties” and “Logical Groups” allow the data center manager an unprecedented and completely customizable insight into both the capital and running costs of the data center. By using “Logical Groups” a data center manager can calculate the cost of networking services, storage services and the like. 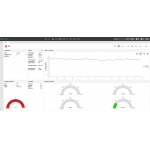 RAMP DCIM also enables the data center manager to quickly evaluate what if scenario’s such as maintenance on a UPS and what devices will be impacted during this maintenance period. Similarly, RAMP DCIM can present impact tables on network devices. Quickly evaluate “what-if” scenario’s such as maintenance on a UPS and what devices will be impacted during this maintenance period. FULLY AUTOMATED IT ASSET MANAGEMENT ELIMINATES PAINFUL MANUAL WORK. RAMP DCIM eliminates the manual data entry of IT assets by retrieving the detailed configuration data directly from the asset itself. RAMP DCIM utilizes multiple communication protocols – including SNMP, IPMI, WMI, WBEM, iLO, DRAC, ALOM, RSA, SSH and others – to gather and correlate the data. Rather than just collecting “readily visible” data (typically name, manufacturer, model, location and serial number), RAMP DCIM collects detailed configuration information. For a server, for example, RAMP DCIM collects hardware information (processor, memory, physical and logical drives), services, network interfaces, operating system, installed software, hosts and more. You can add your own user fields, attach documents such as user manuals or purchase orders, and search and report against one asset or a group of assets. RAMP DCIM doesn’t stop there, however. It utilizes a sophisticated analytics engine to determine the relationships between devices. It can automatically determine network and power paths and which virtual machines and services are running on which systems. When used with an intelligent cabinet, RAMP DCIM can automatically tell you where the asset is located down to the rack U level and even tell you what outlet the asset is plugged into. EASY TO USE DCIM SOFTWARE THAT MONITORS EVERYTHING. 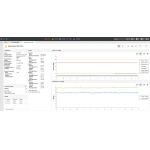 Tuangru’s all-in-one data center management software allows you to seamlessly monitor the three layers of your data center: facility (UPS, CRAC, environmental), IT (servers, storage, network devices) and virtual (VMs). Use our DCIM tools for continuous monitoring, alerting and reporting on your entire data center facilities, IT assets, and virtual environment through your preferred web browser. RAMP automates change management and provides real-time sensor data such as power, CPU utilization, and environmental conditions. RAMP’s ability to manage everything from the virtual machine to the IT equipment (servers, storage, and network) to the power and cooling infrastructure helps you to understand and more effectively operate your data center. Tuangru DCIM solutions are fully scalable and all data is fully accessible via published web services API to allow you to easily integrate the solutions with your existing data center management platforms. Tuangru is a leading marketplace platform for buying and selling data center technologies, combined with integrated SaaS applications like DCIM, to deliver greater cost control, visibility and management to data center operators. In September, 2016, Tuangru acquired No Limits Software, developers of RAMP DCIM software.